Does that not require an expensive cable TV subscription? Yes indeed, it does, but who says you have to invest in a cable TV? If you have a fast internet connection, we have a solution for you that can allow you to watch all your favorite sports, minus the hassle. Yes, you heard that right. Install Kodi and enjoy the wonders of free entertainment! Read this guide by BestVPN and best vpn for kodi to figure out how to watch NFL on Kodi in the most convenient way possible. As we get closer to fall, we often turn our thoughts to the gridiron, tailgate parties, and of course, the National Football League (NFL). However, the problem is that obtaining NFL game tickets often involves a great deal of hassle. It involves fighting traffic and crowds, wasting a whole lot of time, which can be spent better elsewhere. Now, there is no denying that nothing beats the excitement and fun of watching the game live, but what if you want to see it at home, with a bunch of friends? The NFL Network on Kodi 2017 is a bunch of extensions that provide a ton of exclusive content for fans of American football. When you install the NFL Game Pass add-on, you can gain access to fantasy talk, debates/discussions, breaking news, replays of weekend games, and broadcasts of Thursday Night Football games. When it comes to watching the NFL live online, it is not necessary for users to rely on Kodi entirely. You have many options available on the internet that allows for the streaming of movies/TV shows freely, along with live streaming events of sports and PPV. If you want to stream all matches of the NFL, sign up with any of the services below, each of which even offers a useful 7-day free trial for testing! Sling TV is one of the most reliable and famous VoD services on the internet, which provides online streaming fans the ability to enjoy all popular events, including the famous NFL 2018. 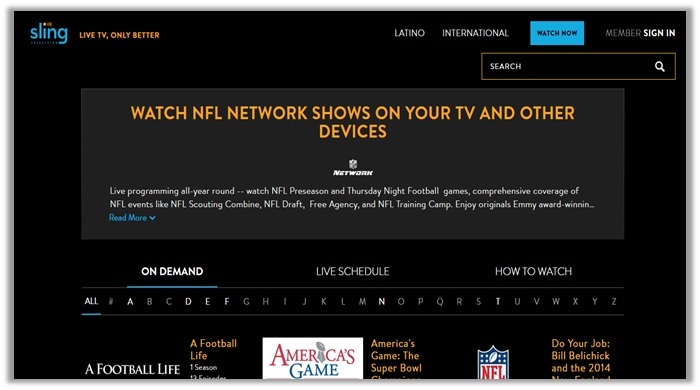 It offers a huge collection of channels that make it easier to watch all matches of the NFL. The starting price is valued at $20. However, you do have $25 and $40 plans, which add more variety to the channels. These include BeIN HD, ESPN, Sky Sports, Willow HD, and more! You even have a 7-day trial available. For users who stream movies/TV shows on there, PlayStation may also look for solutions to watch LIVE events on their gaming device. This is where PlayStation Vue comes in, offering a remarkable service for $40 per month, which is backed up by a 14-day FREE trial. Once you sign up, you can gain access to live streams of the NFL, without any hassle. The best part of all: you receive HD quality streams, which makes the whole streaming experience a lot more worthwhile. 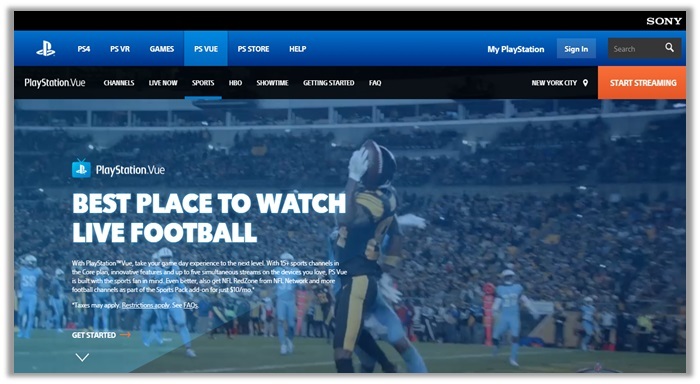 DirecTV Now is another reliable option for watching all matches of the NFL 2018 live online. The website offers streams for all major tournaments and event since it includes all popular channels like NBC, Fox, CBS, ABS, TBS and various others. It offers a plan that gives you access to 60+ hit channels for just $35 per month. As a result, you can feel assured that you have all the necessary channels available for streaming the event at maximum convenience. 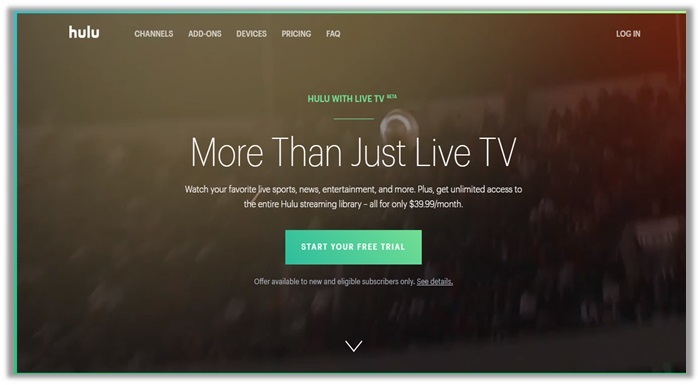 Hulu Live TV is quite similar to Sling TV and DirecTV Now, offering a massive library of content from around the world, including movies/TV shows, news, and live sports. You can gain complete access to the service by paying just $39.99 per month. You can even leverage a 7-day trial to test drive the service. However, it is guaranteed that there will be live streams available on Hulu. When it comes to streaming the NFL on Kodi, you may come across some add-ons that will give trouble in accessing certain content. This may be because of geo-restrictions that prevent users from outside countries. VPNs are a quick fix to this problem. In addition to unblocking add-ons, they also boost your online privacy and security, which is crucial when using third-party extensions that grant access to pirated content. 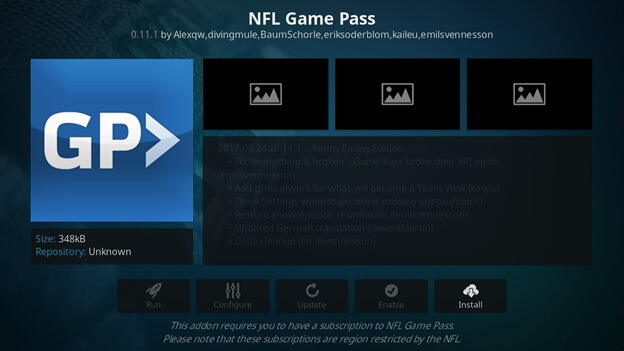 Unfortunately, you cannot use the NFL Game Pass Kodi add-on, without purchasing a subscription. If you want to unlock unlimited content for watching your favorite matches, gaining insight into top players, and analyzing leading teams, you need to pay $124.00. While the price is high, you can opt for a free trial that lasts for 7-days. You can cancel your subscription at any time. You can download the add-on from the official Kodi Add-on Repo. 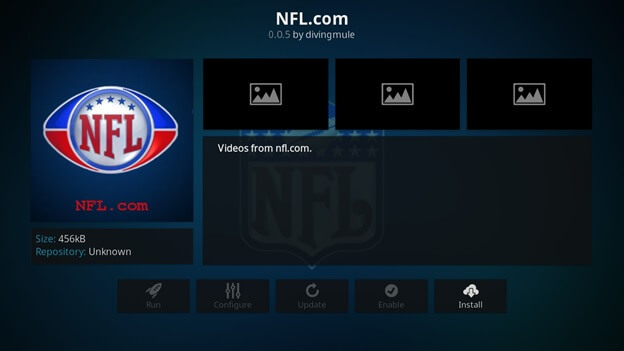 Enter your username and password to begin streaming NFL content! How to Get Kodi NFL Game Pass Free? 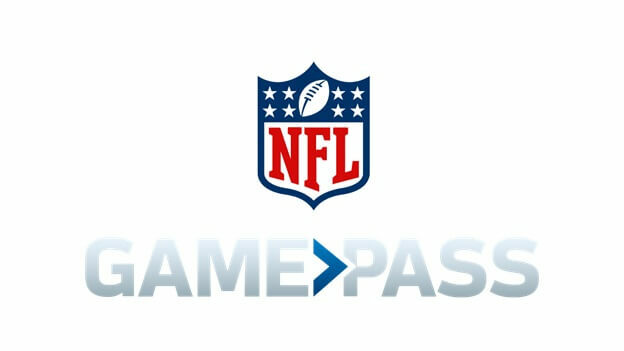 Unfortunately, you cannot use the NFL Game Pass Kodi add-on, without purchasing a subscription. If you want to unlock unlimited content for watching your favorite matches, gaining insight into top players, and analyzing leading teams, you need to pay $124.00. While the price is high, you can opt for a free trial that lasts for 7-days. You can cancel your subscription at any time. If you are a National Football League (NFL) fan, you probably know that RedZone is one of the most famous American sports television channel, operated by the NFL network. As such, it offers football fans the most diversity and convenience, when it comes to watching daily matches and special events that are broadcast on Sundays regularly during the NFL season. Though you do not have access to a RedZone add-on, you do have a DAZN extension available, which provides access to the channel. Download the DAZN Zip File from here. Open Kodi and select “Add-ons”. Click on the “Package” symbol. 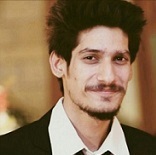 Press “Install from Zip File”. Use a Torrenting VPN and connect to a Canadian Server. Enjoy streaming NFL via RedZone Channel. For this instructions guide, we will select two different add-ons for watching NFL on Kodi. The first just like the above is an official Kodi extension, and the second is another third-party add-on. 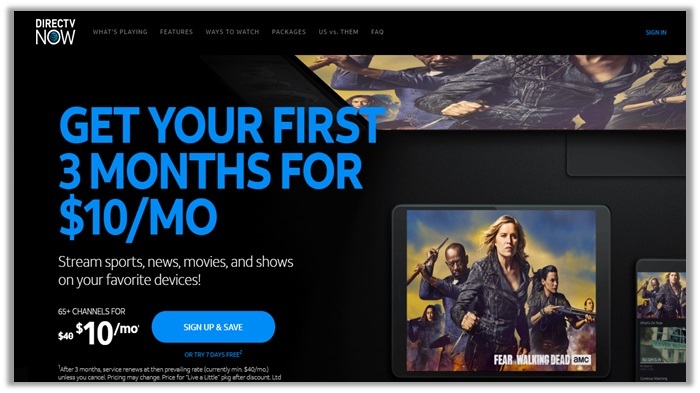 Please note: This official Kodi add-on does require you to purchase a subscription, but it may not necessarily feature live matches. You can only see highlights, match analysis, and opinions from experts. Be advised that before going further, make sure that you have installed the best VPN for Firestick device in order to enjoy the best streams on via best kodi addons. Enjoy watching NFL on Firestick via Kodi! 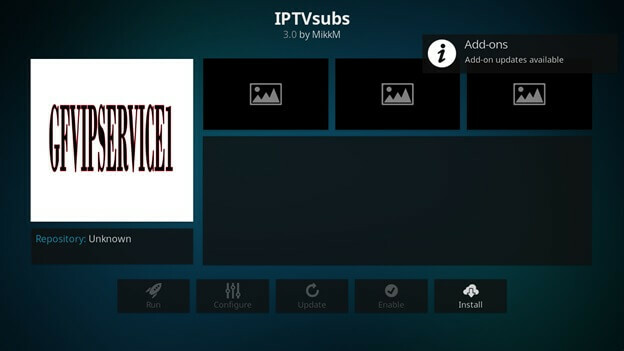 Find IPTV Subs and hit the install button! How to Watch Kodi NFL Replays? If you want to watch replays/highlights of your favorite NFL matches, you can always use the official NFL.com add-on. By installing the extension, you can gain access to NFL highlights, analysis on each football match, and expert opinions. Follow the steps above to install the add-on. When it comes to watching the NFL on your Roku device via Kodi, things are not as complicated as they may seem. Since you install Kodi and gain access to its complete list of add-ons, the viewing process would be the same as any other platform. This means, if you want to watch the NFL games, follow the steps above for installing the NFL Game Pass, Elektra Vault, NFL.com, Sports World, or DAZN Kodi extensions, all of which provide complete coverage of all NFL related events and PPVs. Similar to how you can use Kodi to stream movies/TV shows and live events on devices like Roku. Users also have the ability of installing the open-source, multi-platform entertainment software Kodi on their Xbox One gaming devices. 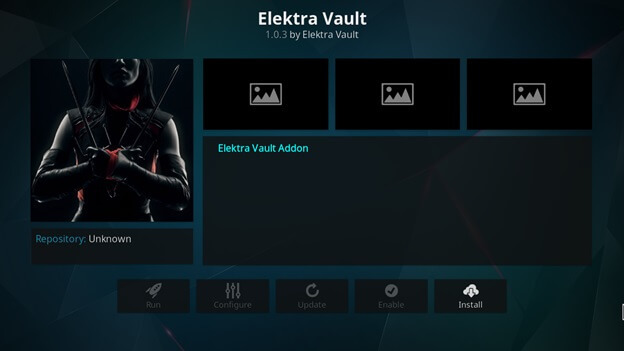 This means, if you want to begin watching the NFL, you can rely on third-party add-ons like Sports World of Elektra Vault. However, if you want to go official, you may need to use a reliable Xbox One VPN to access the NFL Game Pass, NFL.com, and DAZN add-ons. Comment from discussion djimbob’s comment from discussion "Anybody ever use NFL Game-pass be willing to answer a few questions?". Can You Get the NFL Sunday Ticket without DirectTV? Users that do not have access to DirecTV subscription often wonder whether they can obtain the NFL Sunday Ticket. The truth is, you can only get one if you are living in an apartment building where the DirecTV Service is not available or reside in a list of approved universities. Once done, you can easily gain access to the NFL deal from DirecTV and purchase the package. There is no doubt that Kodi is the ultimate destination for all your entertainment needs, which includes watching live NFL matches. Feel free to share the article with your friends who are trying to figure out an easy way to watch NFL on Kodi. can not find packages installer, lost ! Hello Richie, we’re a little confused as we couldn’t understand your question properly. Could you elaborate more as to which “Packages Installer” you cannot find? 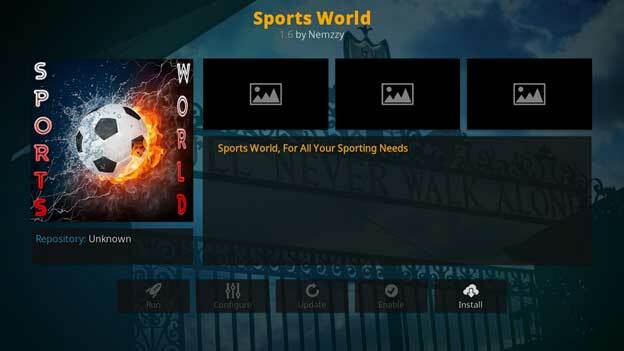 did not find Sports World… I have updated Kodi installed. Thanks for commenting Shane. We apologize for not getting it right the first time. Repositories regularly update/change their list of add-ons. The Stream Army did have the Sports World extension before, now it isn’t available. You can, however, find it in the Kodi Israel repo.